Did you know that you can decorate your kids’ clothes and other sewing projects with HOMEMADE iron-on decals? That’s right – according to Lindsey over at Filth Wizardry, you can make permanent decals from plastic shopping bags. So check out her post for all the details and be sure to also read her follow-up posts linked to at the bottom. Lindsey has a lot of cute ideas and great photos, so browse around Filth Wizardry to get many cool ideas. 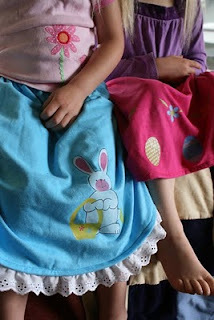 And when you’re done there, check out the simple and cute skirt-from-a-t-shirt how-to over at Mama Smiles. What a great project for a sewing beginner! In fact, why not make the skirt and then decorate it with your own decals?